We recently had to copy a postal address in the Russian alphabet from an email to a package with a non-digital pen. To make the foreign address easier to see was surprisingly easy, Windows key plus '+' (plus sign) zooms up the screen 100% and pops up the Magnifier window. Windows key plus '-' (minus sign) takes the screen back down again ... sorted. If like us you've got a euro sign on the $4 key but don't know how to get at it the trick is the angry dog key (Alt Grrrr) immediately to the right of the spacebar; whilst holding down Alt Gr press and release 4 ... € see, it works! A slightly weird keyboard shortcut Shift + Windows key + arrow up, this maximises the height of the current window but does not change the width. Shift + Windows key is not the easiest combination if you're a cack-handed typist. Hopefully you know the keyboard shortcut Ctrl + C which copies a selection? Ctrl + Insert does the same thing and if you're a one finger typist you might find Ctrl + Insert easier to do with two hands. Hopefully you know Control Plus Zed, It Saves Your Head? Keys Ctrl + Z undoes your last edit and can be an absolute lifesaver when you've failed to control the beast within. Going with it you should know Ctrl + Y which redoes your undo when Ctrl + Z was the beast within at play. Windows logo key + M minimises all windows, makes sense Minimise and a quick way to see your desktop picture. Windows logo key + shift + M restores the windows except it seems to get a bit confused if there are multiple monitors. The keyboard shortcut CTRL + C will copy a selection, makes sense. Shortcut CTRL + X cuts (copies then deletes) a selection, just about makes sense but CTRL + V to paste what's been copied? The reason is historical, when Microscoft first started writing Word the default word processor was Wordstar and Microscoft just copied their shortcuts so it would be easier for peeps to move from Wordstar to Word ... and now it's part of Windows. Friday night Country Vision Framlingham asked us about Ctrl+f4 and as increasingly these days our look up table failed ... it closes the current file or tab unlike the similar but different Alt+f4. What's more we weren't too certain about the ever popular Shift+f3 either. Here's a tip worth repeating, pressing user key f11 (keyboard top row towards the right) in your browser and the toolbars and all the other crud go away, pressing it again brings them back. Full screen is particularly rewarding when looking at pix in Facebook lightbox or Facebook 'theater' mode. 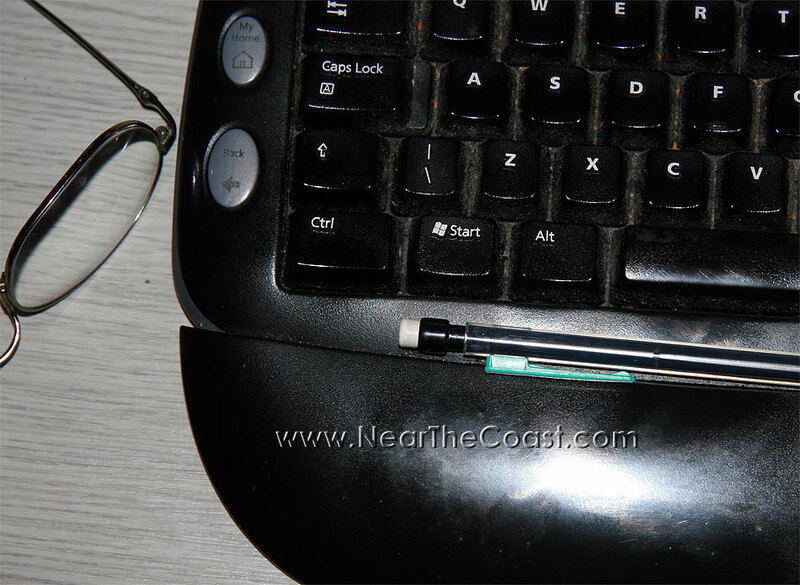 Thought we'd pointed this one out before but can't find it so here it is again; with your thumb hold down the left hand Alt key (usually next to the space bar) and with a finger press and release the Tab key. A new window will pop up showing your open apps, still holding the Alt key down press and release the Tab key until the app you want next is highlighted, release the Alt key and the highlighted app will become the foreground application. Whilst holding down the Windows key press the Break/Pause key usually top right somewhere to get the System Properties window up giving fast tab access to a lot of tweakable stuff. 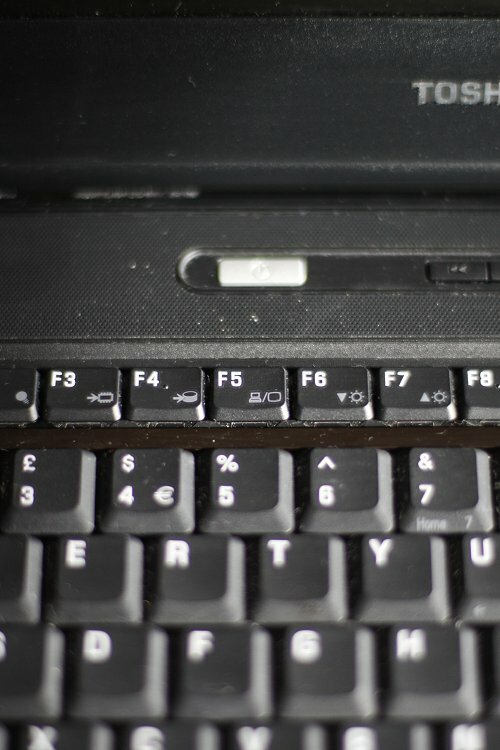 Hold down the Alt key to the left of the space bar and press user key f4 on the top row, the current window closes, saves having to reach out for the mouse. User key F5 in the top row usually refreshes or reloads whatever you're doing. It's particularly relevant in your web browser; the browser normally only pulls in a web page from the Internet when you first visit the page during a session, when you return to the page during the same session the browser shows you what it loaded last time and with a frequently changing web site like this one the displayed page could be out of date. Pressing user key F5 makes the browser reload making sure you see the most up to date page. User key F5 is also useful when a page seems to be not loading or stuck, using F5 to re-start the page load will sometimes clear the log jam on the Internet. If you hold down the Control (Ctrl) and Alt keys bottom left of the keyboard and then press the Delete key you will open the Windows Task Manager and the Applications tab will list all the programmes you have running. If one of your programmes has got stuck (probably with a Not Responding status in Task Manager) and won't let you close it you can force closure by highlighting (like Near The Coast etc in the pic) the prog in the Apps list by clicking on it and then clicking the End Task button. Task Manager can sometimes be a little premature. In the pic the bottom New Folder is shown as Not Responding but it was Adobe Bridge as always being slow to sort itself out at start up and later its status changed to Running. 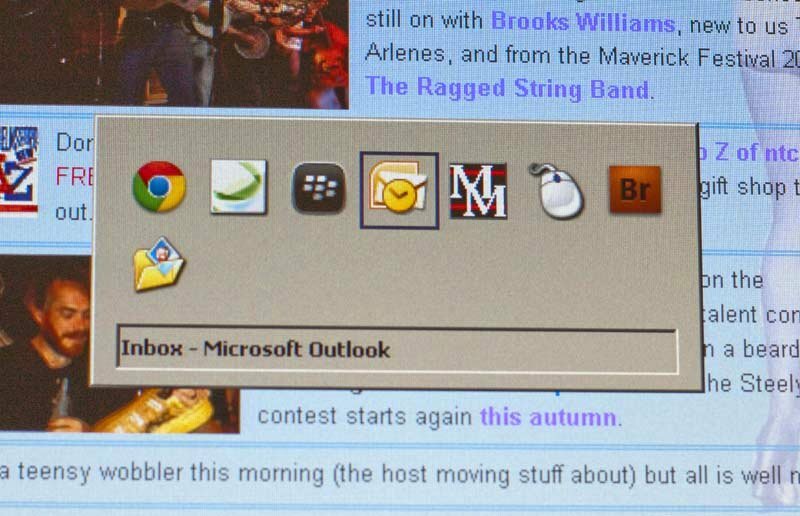 In both Internet Explorer and FireFox pressing user key f11 (keyboard top row towards the right) makes the toolbars and all the other crud go away, pressing it again brings them back. Here's a good one to worry the children; whilst holding down the CTRL and Alt keys (bottom left) press and release the arrow right key, that's the → key not thekey. Good eh? Try Ctrl+Alt + the ← and ↓ keys and the ↑ key to get back where you started. This one's always popular so worth repeating; open a Word document and highlight a word or phrase. Whilst holding down the shift key press and release the user key F3 on the top left there ... now do it again ... and do it again, good eh? You absolutely have to know about Control Plus Zed, that's whilst holding down the control key press and release the Z key. Ctrl + Z undoes your last action; for example in file explorer you've just deleted a file? Ctrl + Z will restore it. Just accidentally deleted a massive table? Ctrl + Z will restore it, it's oops on turbo boost. Regret the past 35 years of marriage? Well there are limits. Press Ctrl + Z a second time and your action before last will be undone; for example the file you deleted before the one that's just been restored will be restored. Eventually after repeated Ctrl + Zs it will stop restoring because only so many actions are held by the system. An irritating gotcha in some apps, notably Photoshop which just loves being just a bit different, is Ctrl + Zing a second time undoes the restore from the previous Ctrl + Z so you are now back where you started. You need Ctrl + Alt + Z to step back through the action history. So chant it now Control Plus Zed, It Saves Your Head. Here's a tweak we think useful for everyone. 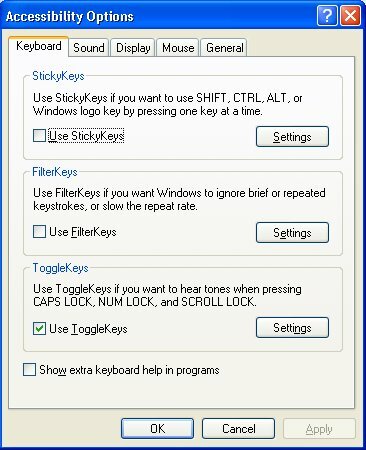 Go Start/Control Panel/Accessibility Aids ... yes, Accessibility Aids, click the Use ToggleKeys check box to get a tick in the box and click OK to close the window and save your settings. Now press the Caps Lock key on your keyboard, you'll hear a high pitched beep if you're turning caps lock on and a lower beep if you're turning it off. We find the beeps useful not because we use the caps lock much (when caps lock is on all your typing is in CAPITALS) but it warns us when we accidentally turn it on when an unattended finger misses the tab or shift keys ... and it shows you don't have to be disabled to use the Accessibility Aids. 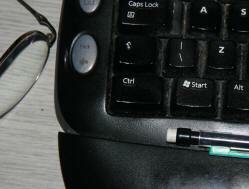 Whilst holding down the Windows key (usually second from left bottom row) press and release the D key. Do it again. 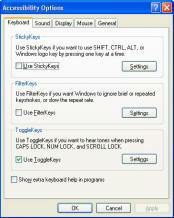 The key combination minimizes or restores all open windows, so a quick way to see the desktop. The Brewer claims he gave up on computers when Ali told him To stop the computer you press the start button ... These days we'd be hard pressed without the Windows key, the one that usually nestles second from left on the bottom row of the keyboard. But what if your keyboard doesn't have a Windows key? Or the key cap is missing or you can't find the bloody thing on a strange laptop? There is a work round, whilst holding down the control key (far left bottom row) press and release the escape key (far left top row), up pops the Start window on the screen! There is a limitation, you can't do clever stuff like whilst holding down the Windows key press and release D minimising all open windows and revealing the Desktop. Here's a bit of good clean fun. Whilst holding down the Windows key press and release R. This will pop up the Run window. 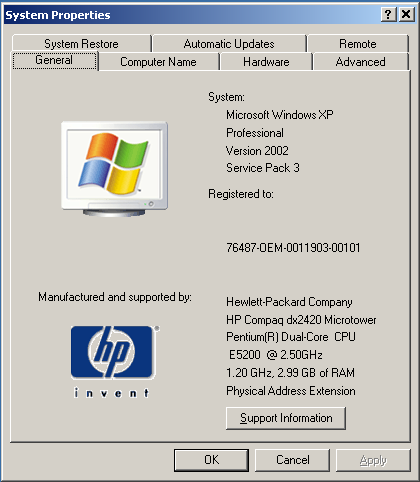 (The W indows key is usually second left bottom row and marked with the Windows logo, and sometimes with Start. Another way to pop up the Run window is to click on Start [bottom left of the screen] and then Run.) Type osk into the Run window text box and then click OK.